Even data scientists need ways to unwind. When I started doing quantitative research at IEX about three years ago, I became obsessed with market microstructure. Maybe a little too obsessed. I caught myself complaining about the low sock liquidity levels of my wardrobe and chiding my faster-eating friends for “co-locating with the ketchup.” I needed a hobby. So I started learning how to box. Learning to box is a slow process. It takes years of careful work, building precisely choreographed movements into muscle memory until they become instinctive, slowly adding complexity and reducing reaction times. To an outside observer, a boxing match may look chaotic and unpredictable — a lot of seemingly pointless shuffling punctuated by small explosions of activity. The market for U.S. equities looks a bit like this at a millisecond scale: quotes holding steady, then shuffling around, then a small flurry of trading activity, then shuffling, then steady, etc. In any given day, there are over 8,000 stocks trading over the course of 6.5 hours, which is 23,400,000 milliseconds. Multiply this by 8,000, and we get over 180,000,000,000 millisecond units of market (in)activity, indexed by stock. 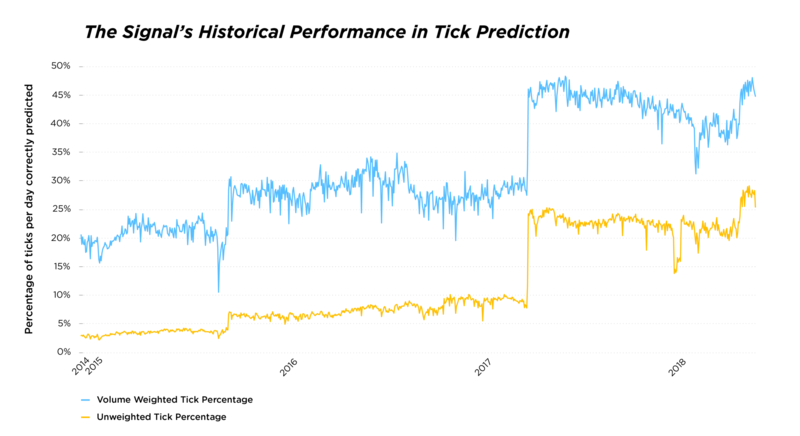 Over the course of a day, the National Best Bid for some stock ticks down (the highest price advertised by a buyer in the market decreases) or the National Best Offer for some stock ticks up (the lowest price advertised by a seller in the market increases) approximately 10,000,000 times. While that is a huge number of price changes, it actually means that less than 1 in 10,000 of our millisecond/stock units contain a price tick. Additionally, the ones that do are not evenly distributed — about 40% of price ticks happen within one millisecond of another price change. At this millisecond scale, the market is a boxing match — with lots of shuffling, quick sequences of punches, and comparatively long rests between rounds. One of the first things I learned about boxing was how to watch my opponent’s shoulders. If a punch could land in the same instant of its conception, it would be impossible to anticipate. But a powerful right cross that begins as a glint in your opponent’s eye becomes a movement in the shoulder before it lands as a punch. If you are watching the shoulders, you’ll know what’s coming, and you can prepare and respond. Of course, the process isn’t perfect. There are variations in the movements and timing, and deliberate fakes that can be confusing. Price ticks are kind of like this. At any given moment in time, there are often multiple exchanges quoting the same best bid and best offer prices. For the National Best Bid to move down, for example, every single buyer advertising at that price must either cancel or trade, clearing the way for a new lower best bid. Often, this isn’t an instantaneous change — it is a sequence of discrete events, spread out across disparate data centers miles away from one another. Packets of information whiz back and forth between these points through microwaves and across fiber optic cables, faster than a human being can discern, but not so fast that a machine can’t recognize a typical pattern in motion and capitalize on it. The process of a price change often takes hundreds of microseconds or even a couple of milliseconds — plenty of time for automated traders to see the shoulder move before the punch. 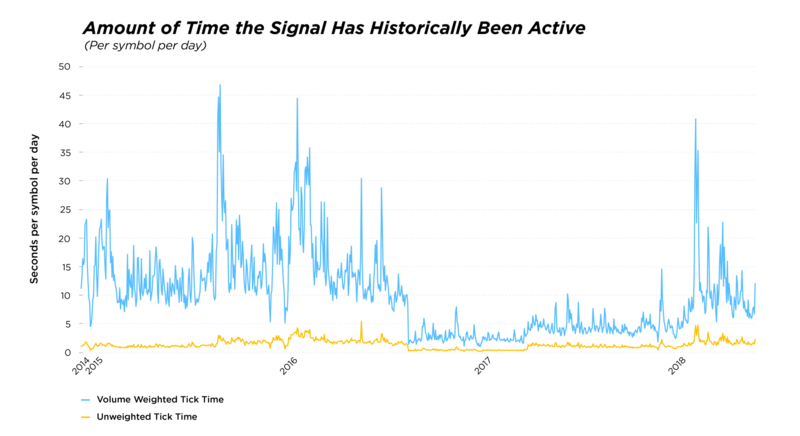 To help democratize this capability, we built the IEX Signal, a predictive model that identifies 2-millisecond periods when prices across the market are likely to change. When we recognize a pattern of events in the quoting of a stock that has historically been quickly followed by a price change, we “fire” the Signal, which triggers more cautious behavior in our Discretionary Peg and Primary Peg resting orders for up to 2 milliseconds. Essentially, this allows them to slip the punch. Coupled with the protection of the speed bump, our predictions are highly effective — even if a fast participant sees the same pattern we do, at the same moment, it will take them 350 microseconds to get their order through the speed bump to pick off orders resting on IEX, whereas our Signal will put the protection in place immediately. The first version of the IEX Signal was deployed in 2014. So why am I telling you all this now? Well, we just released version 5, and I have to say: our years of steady work and training are really paying off. With each version of the Signal, we become more nimble and are able to recognize price changes in ever more subtle guises. In retrospect, our first version was a little like a boxer who was really good at dodging a right hook, but would get dumbfounded by a left uppercut. This is just part of the learning process — we gradually trained ourselves to recognize further variations on a theme, keeping our eyes open and shrewdly adding to our repertoire. The fifth and newest version of the Signal is a particular favorite of mine, because it comes with re-fire capability. The prior versions made a prediction and then sat idle for 2 milliseconds until the prediction expired. This is like blocking a punch with your elbow and then leaving it there, frozen in place for a long pause. In the meantime, you might get hit somewhere else. Signal 5 can refire (i.e., make new predictions) immediately if a price change occurs, which is analogous to moving your elbow as soon as the block is completed. The newest version is also less distractible — if the NBB is exhibiting signs of transition, and a change occurs on the NBO, the prior versions of the Signal would discard observed data on the NBB side that occurred before the price change. This made sense to us at the time, since movements on both sides can be correlated with a NBB down tick. But upon reflection, it was kind of like a boxer seeing the right shoulder of the opponent start to move, and being distracted by a motion in the left hand. You don’t want to ignore the left hand completely, but if you abandon your surveillance of the right shoulder as a result, you increase your chances of being hit in the face. This is especially important in volatile markets, when both bids and offers are moving in quick bursts. During the extremely volatile week of February 5–9, 2018, for example, the number of price changes in a day spiked to 3 or even 4 times its typical range. Our Signal (version 4, which was in production at the time), stepped up proportionally and correctly predicted nearly 3 times the number of price ticks as it does in normal market conditions. But despite this excellent performance, it was handicapped by its distractability and lack of refire capability. In those volatile conditions, version 5 of the Signal would have been an even larger relative improvement over Signal 4 than it is during calmer market conditions. In case you are worried that the Signal is too defensive, and you don’t want to miss out on trading opportunities in the moments our new Signal identifies, let’s pause for a reality check. The short 2 millisecond windows when the Signal is active add up to only a small fraction of the trading day — a flat average of less than 2 seconds per stock, or a volume-weighted average of about 5–9 seconds per stock. And yet, our correct predictions cover about 48% of price ticks on a volume-weighted basis. The moments when the Signal fires exhibit dramatically different market behavior: resting orders that trade in these moments experience much more adverse selection, and incoming orders to our market are aggressive and predominantly coming from proprietary trading firms, whereas our market at other times exhibits a healthy mix of participants and high execution quality for resting orders. Naturally, there are always tradeoffs — too much defense would eventually hinder offense. But we tune the Signal very conservatively for this reason and work hard to ensure that it does not obstruct healthy trading. One noticeable consequence of all this is lots of healthy midpoint trading in stable market conditions. 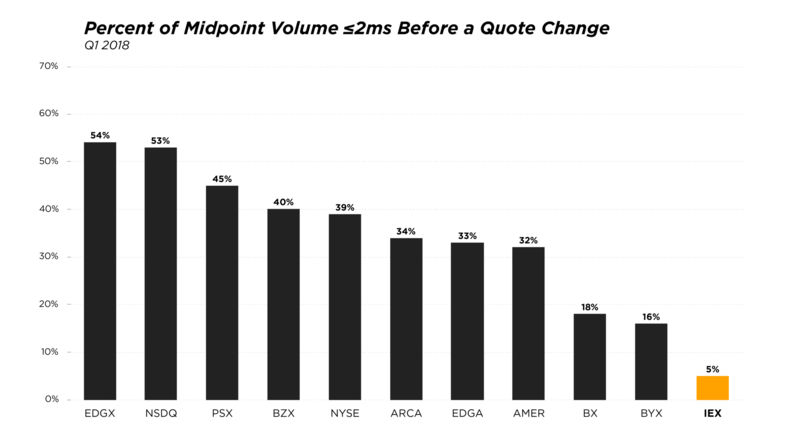 55% of IEX volume trades at the midpoint, and only 5% of this occurs within 2 milliseconds of a price change. For contrast, on the maker-taker exchanges, up to 54% of midpoint trading occurs within 2 ms of a price change. That’s a little crazy when you consider that one of the main goals of midpoint trading is to execute without moving the market. I have to wrap it up here because I don’t know yet what Signal version 6 will look like, but I know we will continue to work hard and innovate in order to keep evolving our market to be as fair and effective as possible. Even as we are constantly improving, there’s always more to learn. The latest thing I’ve learned about boxing is that it’s not advisable to think about stock prices while sparring. And my training partner has a mean left hook.